The most effective use of soy-bean oil cake and full-fat (extruded) soy-beans is observed in the most intensive industrial branch - poultry breeding. For example, in the USA about 50 % of all produced soy-bean oil cake is used for needs of poultry breeding that becomes a determinative factor for increase of production of broilers meat and eggs. After respective processing reducing level of anti-nutritional factors to the safe level soy-beans with full content of oil (full-fat, non-defatted, full-fat soy-bean) is considered to be n excellent source of energy and high quality protein. Extruded soy-beans is well digested by all types of birds, it contains fat with 50 % of linoleic acid that should be obligatory present in birds’ ration. Intensive feeding of broilers is possible in case of prevailing introduction into ration of soy-bean protein that contains all amino acids in suitable ratio and amount, except methionine deficit of which is usually substituted with synthetic forms, and betafin, or (partially) choline chloride (source В4). 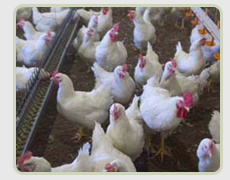 Soy-bean oil cake and extrudate are an excellent fodder for broilers. British company Favor Parker LTD, that occupies with production of full-fat soy-beans, has carried out investigations (in industrial poultry factories) with two rations: with use of soy-bean oil cake and with processed, non-defatted soy-bean. Better indices of fodder on rations with non-defatted soy-bean are provided by high digestion of energy and protein. Extruded soy-bean gave better results in comparison with rations containing soy-bean oil cake and animal fat (see table 1). 1. Increase of content of exchange energy up to 17 MJ in 1 kg of fodder dry matter. 2. Effective substitution (for 34-41%) of need in tested soy-bean oil cake at the last stage of feeding with improvement of conversion and performance indices, including without increase of mortality or worsening of carcasses quality. 3. Increase of content of the most important, essential fat acids (linoleic, linolenoic acid) in carcasses that increases their biological nutrition value for human. 4. Use of extruded, roasted, autoclaved soy-bean in comparison with raw soy-bean or alternative sources – pea, fodder beans – confirms economic efficiency, increasing potential profit from broilers for 30 – 40 %, and from barndoor fowl from 2.8 to 13.6 $ per one ton of combined fodder. - differences of productivity may be caused by uncontrolled process of thermal treatment (broilers are sensitive to increased content of inhibitors and overheating, recommended indices of urease activity are 0.02 – 0.1 pH). - share of extruded soy-bean in loose combined fodder is no more than 20 %. Granulation is required in case of increased level of introduction. The best results were obtained for pullets that were fed with soy-bean extrudate, and then, at productive stage – with tested soy-bean oil cake (table 2). 1. Effective alternative of soy-bean (as well as sunflower) oil cake in receipts of combined fodders and protein and vitaminous mineral admixtures for pullets and layers, with increase of shell quality and reduction of fodder consumption per 1 egg (for 7 %), increase of layers’ performance (up to 4 %). In comparison with sunflower oil cake these indices are even higher. 2. Possibility of complete satisfaction of bird’s demand for linoleic acid (soy-bean extrudate is a homogenous oily mass with content of this acid of 9.5 – 10.5 %) that improves metabolism and reserves fatness and weight of carcasses. - permissible level of soy-bean extrudate introduction is up to 20 % by weight of combined fodder. Solving of problems connected with fattening of live weight and fat in carcasses. The best indices in comparison with soy-bean oil cakes. At early stages of growth (7 – 8 weeks) safe level of introduction is up to 10 %, further until slaughter without negative consequences – up to 20 % by weight of combined fodder.